Today I'm going to be talking about money! Specifically- how to save it. If you'll remember, a few months ago I did a post on how I create a budget (if you haven't seen that post click here to check it out!) This is sort of a follow-up on that post, where I'm going to talk about different ways to cut expenses and generally spend less money. These are the tips that work for me (or things that I'm testing out), but I would love to hear how YOU save money! - Use "airplane mode" when you're in an area without wifi. So many applications use data constantly (all of those annoying alerts, email refreshes, apps running in the background...). While waiting for my bus or for the elevator, I would mindlessly scroll through Instagram, Facebook, and random other sites, which would just add up to a huge amount of data. - Download music and podcasts. When you're using wifi, feel free to download freely, so that you don't have to stream music and use up data! Now, I listen to podcasts and really pay attention to the story rather than going through social media when I'm waiting around! - Amazon Prime offers free music downloads, free kindle downloads and rentals, free shipping, free TV shows and movies, and special discounts throughout the year. - Target has a credit card that offers 5% off every purchase as well as free shipping and 30 extra days to return. I opened one when I got my first apartment and have saved tons of money throughout the year, and always make sure to pay off my balance each month! "1 hour only- save 40%!"... "500 Bonus Points with any purchase today!"... "FREE Gift with Purchase!" That's right..you can get money for buying alcohol! - Make a spreadsheet! This is similar to "window shopping" for me- if I'm browsing the web and find something that I like, I save it to my shopping spreadsheet along with the current price and the URL. I periodically check this price and update my spreadsheet. Then, when I'm ready to make a purchase, I can figure out if I still actually want the product, and see if it's really a good deal! There are websites that can do this for you, but I love Excel and prefer to do it myself! - Get a lightweight backpack, and pack a change of clothes. Of course, you don't want to wear your running clothes to work, and I wouldn't want to run home in a dress! I try to plan an outfit that's easy to pack away and bring clothes that are light weight and don't take a lot of room in my backpack. The one I use works really well and doubles as a hiking bag when we walk with Selma! (similar, similar). - Make sure you eat enough and hydrate all day. I could never figure out why I felt so bad every time that I ran after work, then I realized that I wasn't hydrating properly and was running fasted. I make sure to bring a snack to eat about 2 hours before I run, and drink tons of water throughout the day. I also bring along a handheld water bottle which really helps! If I go out to eat, I spend an average of $10 on fast food, or $15 for a sit-down meal. I would spend about $200 each month. 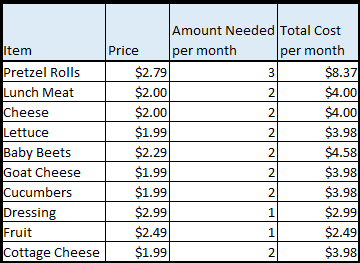 I still occasionally have lunch with a friend or with my team (maybe twice a month), so I'm saving over $130 each month, and eating a lot healthier! I wrote a post on lunch ideas if you'd like some suggestions. Another huge saving that I've seen is bringing my own coffee to work. Luckily, my team has a Keurig that we all use, but I've also seen tons of people bring a thermos of coffee to work. I typically have one coffee a day, which costs $2 at my favorite coffee shop. I also got Starbucks once a week, so my total coffee budget was over $50! My team shares K-Cups, so I typically buy a box every other month, and buy coffee creamer once a month. This equals about $7 per month. Huge savings, plus you don't have to wait in huge lines every day! For my sixth tip, I want to share a few "mini tips". These are tiny things that I've been doing for a few years that really make a difference in the long run! - Don't spend it if you don't have it. This is a rule that my parents always taught me and I've followed my entire life. This is also the number one reason why I have never had any credit card debt- if I don't have the money right now to pay for something, I don't buy it! I make sure that I can always pay off my credit card bills, because fees can be very high and keep adding up over time. The average credit card debt is $5700, and credit cards charge around 10% APR, so you could be spending an extra $47.50 each month just for spending what you don't have! - Auto transfer to savings each paycheck. This goes along with the previous tip- if you don't have the money, you can't spend it! I auto transfer a set amount of money each paycheck to go in my savings, where I can't touch it right away, and it also makes interest! What are your tips to saving money? Have you ever heard of Ibotta or Ebates? Joining Julie's new linkup! This was my top viewed post of November. Well done! This seriously is awesome. I'm with you on bringing my lunch. I maybe go out to dinner twice a month and I'm embarrassed to say that in those cases, my boy friend pays for it! So even though I spend a small fortune buying quality food at the grocery store, I know I'm still saving and am much healthier for it! My dad is a financial planner, so I grew up thinking credit cards were evil. After college, though, I realized that they can be abused, but they can also get you pretty great rewards if you use them correctly! So I finally got one and have already made $400 off of it! But you hit the nail on the head by saying never ever go over it. I couldn't imagine spending more money than what I have! I don't use ibotta or ebates, but I mooch off of my mom's amazon prime for a lot of things and use my parents on demand to watch TV laptop. Haha does this make us absolute millennials? I'm so glad you like this Margaret! $400 is a huge deal, and I agree that credit cards CAN be evil..but if you use them wisely they can be a wise decision :) No shame in mooching..I do the same! Emails are my biggest source of temptation! I'm all for a good deal so when I see "extra 50% off" I have to browse.. and when browsing turns to buying I'm in trouble. I've started unsubscribing from email lists just to save my bank account. Same here! They know exactly what to say to get you to shop...evil emails! great tips--really creative ones too. if my internet wasn't through my cable, i'd give that up asap! That's too bad! Getting rid of cable is one of the best decisions I've made in a long time! 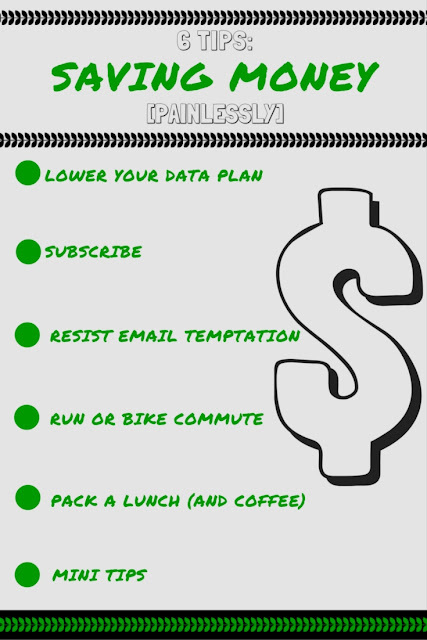 Last yr I switched my dataplan and I'm saving almost $30 a mth just by doing that. I upgraded to 4GB when I got my new phone since I could up it for free. I went over my 3GB in August and have no idea how I managed that. I'd never gotten close. Now I do use Airplane mode more often, especially when I'm at work or sleeping. Wow that had to have hurt...I wonder what ate up all the data? I do my best to ALWAYS grocery shop on Friday evening, or Saturday mornings. Weekends are my biggest temptation to eat out, or grab fast food. But, if I know I have something just as good (and quick) at home, I can resist. Usually that means a frozen pizza, since I love them, but hey, $4 at the store, vs $10-15 for takeout? Since Christmas is coming up, a lot of places will offer gift card deals, like if you buy $25 you get a free $5, or a free burrito, whatever. If it's a place I go often I will buy myself the GC and get some free $ out of it as well. Like you, I unsubscribed from lots of emails. 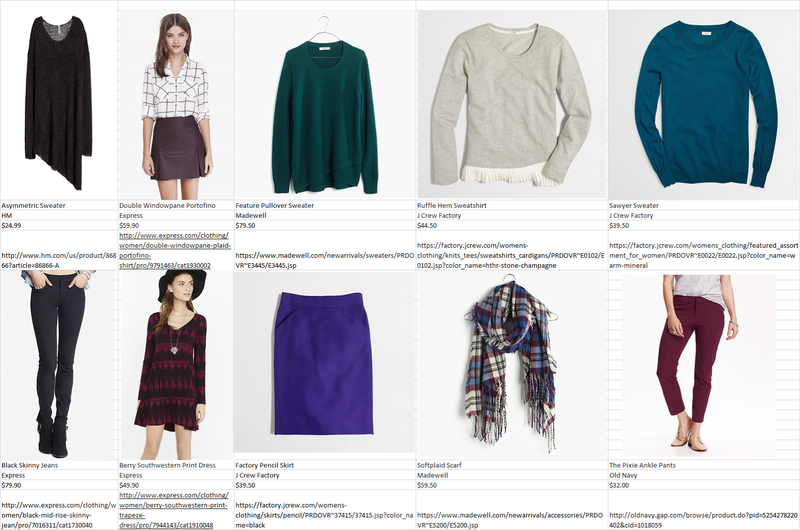 And, if I am ever going clothes shopping I try to make a list of what I need to fill gaps in my wardrobe, rather than falling in love with a piece very similar to things I already have. Good tips. Saving $$$ is a mini obsession of mine, because it means I can go on crazy vacations whenever & wherever I please. Love this! I think my biggest ones are not eating out, not having cable, and NOT spending money I don't have. I almost always try to pay with cash because it becomes way too easy to spend more than you mean to if you pay with plastic. We're money twins it sounds like :) Good habits to get in! Great tips! Packing lunches is such a money saver - I did that all the time in grad school when I was on a small stipend and it allowed me to eat healthy meals and have room in my budget for fun things. It seriously saves so much money! Plus time...I waste so much time walking to a place to eat and waiting for the food! I could talk about money and budgets and saving all day long. When I got divorced and had to do the whole single mom thing on a Starbucks employee budget (how did I ever survive those years?!?) I used cash for everything. I had cash in an envelope for gas, one for groceries, etc. Andrew makes a lot of money, so when we got together I had to teach him a whole lot about not mindlessly spending money on takeout, etc and he taught me a lot about not being extremely uptight about every single cent. We both help each other out, for sure and I still spend way too much money on Starbucks. Post idea for you! I would love to hear your tips..especially since you had to survive a tiny paycheck with a kid..can't even imagine! Very good tips! I am a big fan of packing lunches for work for both myself and my fiancee. It saves so much money, not to mention make life a lot healthier. True!! Luckily Dan's always been good about packing. he has the same thing every day which would drive me crazy, so mine takes more planning! I've heard about Ebates and Ibotta but I'm the worst about using them. i am such a failure.... face palm. I forget a lot of the time too..then I remember how much money I've made from using them...and try to not forget again! Packing a lunch makes such a difference! I have definitely fallen off the wagon a few times when it comes to packing instead of buying though. I have heard good things about Ebates so I will have to check it out! I've been lazy too..but seeing the numbers now makes me more motivated to keep it up! Also wanted to mention that there should be a function on your phone to turn off data/wifi/internet whatever so that you don't have to use airplane mode. Airplane mode is definitely quick since it's one button you can get to from the swipe up menu (well...on apples) but then you can't send and receive text messages. Love the idea of turning off the data when not in wifi though so I'm not tempted to just scroll through stuff. I'm a sucker for coupon/deal e-mails. I've slowly been unsubscribing from companies but I swear... once you get in it's so hard to get out!! That's true...it's so much effort to unsubscribe that I find myself putting it off all the time! I can always use a good money saving tip! I actually love saving money but the hubs, not so much ;) I have unsubscribed from SO many retailers, I honestly don't know how I got on all of the listings to begin with. It removes the temptation of "needing" to check out a sale. One of my favorite ways to avoid temptation! I LOVE Spotify premium. I now spend $5 a month with the student price instead of buying all my music on iTunes, which definitely adds up. While making my own coffee does save money I still buy mine once or twice a week. Some days I just don't have the "oomph" in the morning to make it! These tips are so good! I lowered my data plan to the barest minimum...as in nothing. Now I just use my phone as a phone and use wifi when it's there. These days, there is wifi everywhere, so I don't see the need to add data. Great post! This really comes in handy this time of year when spending can get crazy. My best kept secret is that I'm actually the queen of saving...seriously! 15 years ago I bought the Smart Couples Finish Rich book, which is all about living below your means so you can retire early and/or wealthy & have been following it ever since. One of the big concepts of the book is to think of what really matters to you & spend in that area & scrimp on everything else. For me, what really matters to me is running, which is why my only extravagance is workout clothes. I haven't bought work clothes in years, except for one or two things a season and even then I only buy clothes if they're at least 40%off. As for cell phone, I saved $65/month when I switched from Verizon to Virgin Mobile, which has unlimited data & calling for $35 a month. I did a year-long experiment in how to save money at the grocery store & still use a lot if what I learned. And finally, one specific tip I use is that I never pay for drinks. Water from a fountain is free, and I bring my own water bottle everywhere. Wow- I had no idea Virgin Mobile was so low! I might have to switch as well. I have that book but haven't actually read it..whoops! I think I was really lucky to have lived in the UK - people rarely eat out, most folk bring their own lunch to work and school and mobile data is really cheap! My tip would be to take one month and write down everything you buy week in week out - then you can see where the bulk of your money (excluding bills) really goes - and from there you can see what you actually need to buy and where money is wasted. That's a great idea Jen! I think I would be shocked (and a bit embarrassed) if I wrote down EVERYTHING. There are so many things we don't even think about buying but it adds up! Packing a lunch was HUGE for me for not only eating healthier but saving so much money! These are GREAT tips, Gretch! Eating as many meals at home helps me SO MUCH. I've had bad months where I've spent $150 or more on eating out....like HOW?? Crazy how quickly it adds up without even realizing it! Oh my gosh I love this so much and it WILL be featured next week because everyone needs to read this like now! I already pack m y lunch and coffee but I need to go clean out my inbox from email subscriptions!! Oh wow..I really appreciate that!! Thanks Kels!! This is so awesome and thanks for sharing. Packing lunch and coffee is something I've been trying harder to work on. I definitely cannot say I'm perfect though, especially with the coffee. I'm glad you liked this Hollie :) Thanks so much! I think we can all work on something in our life, so at least you know what you're not perfect about! SO many great tips! I do quite a few of them. We have subscription plans, and I used unroll.me to put all the darn shopping emails into one that I hardly open! I also always packed a lunch and pack the husband one daily. Great idea to lower the data plan! And cutting cable.. we did that and save over $70 a month now! You're a smart lady Heather! Great tips. It's usually those small mindless indulgences that add up! So much of practical information here. I am glad I found this blog as I am planning long road trip, these days I am searcing for different and innovative methods to save money. Thanks a lot for sharing!